THIS ZA’ATAR AND SUMAC CHICKEN, is easy to prepare, with a tangy, lemony and herby flavour that marry perfectly to create this Middle Eastern inspired dish. And that☝?…is exactly what you will find with this Za’atar and Sumac Chicken dish. I fell in LOVE with these 2 spice blends during our sojourn in the Middle East. I remember trying them in almost any dish when we lived in Bahrain. But this chicken dish has always been my favourite. Sumac (Sumach or Sumaq), is a reddish-purple (Crimson) spice that is obtained by grinding the Fruits or Drupes of the Plant genus Rhus, that adds a tart and lemony flavour to dishes commonly made in the Middle East. See how I use Sumac in my FATTOUSH SALAD … and that salad, pairs amazingly with this ZA’ATAR AND SUMAC CHICKEN. Za’atar, on the other hand, is Popular in dishes from North Africa, Middle Eastern dishes, as well as in dishes from Greece and Turkey. It is a combination of Herbs like Oregano and Thyme, as well as Sumac in some instances depending on the region of the world it is produced, together with salt and sesame seeds. Za’atar can be used as a dry meat/fish rub, sprinkled onto salads and flatbreads, even encrusting labneh (homemade cream cheese), this is one very versatile herbal spice blend to have in your pantry. If you haven’t purchased these 2 spice blends on your recent travels to the middle east, look out for them at a local spice store or major food stores, who have also taken to stocking these. Summer days call for quick and easy meals, and this dish proved perfect for a dinner choice recently. I served this chicken with a trio of mezze, my TZATZIKI , and HUMMUS (2 ways), the original Hummus and a Beetroot Hummus (simply add a medium boiled beetroot, or about 8 slices of pickled beetroot, into half the batch of original hummus, and whiz in food processor until smooth). Za’atar and Sumac Chicken, Hummus (2 ways) and Tzatziki, and homemade pita. So, Invite the flavours of the world to your table this festive season, and give this one a try. Would you TRY ADDING A NEW FLAVOUR OF THE WORLD, to your Regular Festive Dishes? Do drop me a comment. Find here below, my super easy recipe to try. ~ Heat the oil and butter in a large skillet (with a lid), and add the marinated chicken. ~ Allow chicken to brown on both sides and then lower the stove heat and cover skillet with the lid, and allow to cook. ~ Done when no more liquid from chicken is left in pan. Looking for a Fulfilling and Delicious Pasta Dish? Then this easy to prepare, Cheesy Toss Up Pasta, with Steak or Chicken, is the perfect one to try. Ever have those days, when you can’t decide if you want a mac and cheese dish, or something more substantial in the form of a steak or chicken dish? I have those some days, and this is one particular Pasta meal, that I enjoy throwing together. This kind of meal dates back to my early childhood days, when my eldest sister, Nazia ?, would whip us up some exciting dishes, especially for us younger siblings. With time I have chopped and changed ingredients, but the basic idea all still boils down to those foodie memories. This post has been long overdue, and once again, these pics have been screaming for my attention for a while now. My Cheesy Toss-Up Pasta with Steak and Chicken, is almost a cross between a few posts I have already shared on this Blog before. I have incorporated ideas from my Mac and Cheese Post + My Versatile Saucy Steak Post + the Cheese Sauce either from the mentioned Mac and Cheese OR Thick Cheese Sauce Recipe here . With it being Summer holidays here for school going kids, and soon for working class adults, There is sure to be a buzz of activities in most homes. This Cheesy Toss-Up Pasta is a perfect meal to prepare for your kids, and adults alike. I remember recently making this cheesy toss-up pasta for my nephews, who visited me with their parents, and since I don’t have any kids of my own, I sometimes struggle with coming up with dishes that would also satisfy my little guests. But a cheesy pasta is one dish I know kids LOVE. And this particular Cheesy Toss Up Pasta, was given the thumbs up once again by my adorable nephews Nasri and Ahmad. Now you can either make this with steak or chicken, I have added mushrooms and peppers for more added flavour and substance, but if you have terribly fussy eaters, these may be omitted. So let me show you how I make this, So you too can whip up this creamy cheesy toss-up pasta for your family this holiday season. ~ marinate with all spices except the Mustard Sauce, tomato sauce and tomato paste. ~ do not dry out steak/chicken. ~ Prepare Pasta of Choice according to pack instructions. ~ Add the rest of the cheese sauce and toss through or serve on the side if you prefer. CHEESY TOSS UP PASTA IS READY TO BE SERVED, BEST ENJOYED SERVED HOT. FOR ADDED SPICY FLAVOUR, YOU CAN SPRINKLE OVER SRIRACHA SAUCE OR ANY OTHER CHILLI SAUCE VARIETIES. This Chicken and Mushroom Filling, Is EASY TO PREPARE AND BURSTING WITH FLAVOUR. A perfect filling for your pasties/cup pies or even a pizza topping. This is one of mine and Hubby, Imran, Favourite way to enjoy a good Chicken Pie. Though I share this during Ramadaan, It is by no means only enjoyed during this month. When I have time, I like to prepare a batch of these pies and freeze them, knowing whenever this cravings for deliciously hot flaky pasties hit, I have some hidden deep down in the freezer? . But in all seriousness, these are so easy to make, that You can do so the same day you want to have them. While working at a food research laboratorty, for a food company, in the early years of my marriage, I had been experimenting with some pie filling recipes. This here is one of my then experiments, which I am proud turned out the way it did. The versatility of this Filling/Topping is also a great plus. I have successfully used it in pies, either cup pies or fold over Chicken pasties. And a perfect way to take your next pizza to whole new level of deliciousness, with this topping. Simple spices, and a Mellow creamy taste is a perfect combination for Ramadaan. Not all pie fillings or pizza topping should be spiced up, sometimes, simplicity is the key to enjoyment. I have shared this recipe many years back with family and friends, and have had some amazing feedback. I do Hope you give this recipe a try sometime soon, and Feel free to drop me your pic feedbacks or comments. ~ Heat the Ghee/Butter in a pan/pot and sauté the onions until soft and lightly golden. ~ Add in the spiced Chicken Cubes and cook, on medium heat, until soft, adding little water to help cooking process. ~ Now add in sliced mushrooms. ~ Allow to cook until water dries up and fillets are cooked, and ghee surfaces to top. ~ When dry remove the pot off the heat source, and when cool, Add in a Few tablespoon, or more, of thick white sauce. You can prepare this white sauce whilst the chicken cooks through. * Ensure the filling isn’t too close to edge of puff pastry, if you are making Chicken Pasties, to prevent it from oozing out when baking. * For pizza, You can also opt to top it with peppers as well. * If you have Fussy eaters at home, The amount of mushrooms can be adjusted to your liking, or even omitted. * Follow the exact same method if you prefer a Steak Version, But I make use of a Pepper Sauce instead of a Regular White Sauce. This Gourmet Chicken Burger is a rather easy to prepare meal, perfect for a Friday Evening or a Laid-Back weekend. I like to have all the topping options prepared and laid onto a platter, making it easier for each one to assemble. Gone are the days when we have to head off to out favourite burger house, to have their signature ‘Gourmet’ Burgers. Today I show you how to make one such feast, that will leave you fully satisfied, with the added benefit of good wholesome ingredients used, you won’t be feeling guilty to indulge on this one. Gourmet Chicken Burger … Ready to Tuck into. So here goes, an easy, no fuss, full of flavour, ‘Gourmet’ Chicken Burger for you to try out next. ~ Add sliced pickled Jalapeño or any other Pickles you enjoy. ~Serve with French Fries and ENJOY!!! For those on a low carb diet, The above recipe works just as well, minus the bread buns, and you could substitute the sauces with fresh salsa or sauce/mayo varieties allowed in your diet. you could also use a regular thick based pan for cooking the chicken fillets on, if you do not have a griddle pan. If you prefer a more saucier option, why not give my Tasty Nandos Strips Recipe a try, except you would butterfly the chicken fillets as stated here. These Savoury Pastry Twists, make for perfect appetisers or light meals, served on a bed of fresh green salad. Can Be prepared in advance, until freezer stage, perfect for when you have unexpected visitors, or just a lazy day make. Knowing how much I LOVE CHICKEN ;-P, These were bound to be a favourite of both my Habibi, Imran and I. This very blog post I had done 3 years back, while I was just getting my footing in the blogging arena, and while scrutinizing some of my older posts, this particular one HORRIFIED me, WHAT an awful looking pic I had put up back then, It was be no means doing any justice to this delicious little yummy. SO Today I did a bit of a revamp to that old post idea, and what better time to share this than right now during Ramadaan. This isn’t by any means just suited for the month of Ramadaan, It can be prepared and Stored in the freezer, until needed. You will find I have included a DIY pic, of the steps, leading the the final pastry wrapped savoury, just before baking. I have successfully used this same method and idea, with a few different cuts of meats, Here I feature using Chicken Drumsticks, But have I personally love these done with Chicken fillet strips or cocktail viennas. * Ginger and Garlic Paste, 1/2 teaspoon Turmeric Powder, 1-2 teaspoon Chillie Powder, Lemon Pepper, Salt to taste, A dash of Mixed Herbs and a squirt of Lemon Juice. ~ Add these chicken drumsticks to a pot with 1/2 cup of water and allow to steam/cook, for +/- 20 minutes. ~ Remove Chicken Drumsticks from the pot and allow to cool well. ~ Beat an EGG OR 2 (depending on how many pieces of chicken you are using), and in a separate plate spread out some Cornflake Crumbs/Bread Crumbs OR like I did Today, PANKO Crumbs. ~ Dip the Chicken into the beaten egg, drip off excess, and roll into the Crumbs. ~ You can Now Fry the crumbed Chicken in a shallow oil, until lightly golden. Remove and drain off excess oil onto kitchen paper towels. At this stage the Chicken Drumsticks are are perfect to be enjoyed as is…. ~ After frying the Chicken, Allow it to cool fully before attempting to wrap the pastry around it. ~ Cut out Pastry Into Long Strips, about 2 finger wide in width, and brush with an egg wash along the length of the pastry. ~ Wrap the pastry Strips Around the Chicken, Allowing for the pastry to Overlap Slightly against the next twist, this creates an almost closed off, and nicely patterned, end result. ~ Brush the top of each wrapped pastry with an egg wash, AT THIS STAGE YOUR SAVOURY PASTRY TWISTS, ARE FREEZER READY!!! ~ BAKE AS FOR PIES, WORKS PERFECTLY BAKED DIRECTLY FROM FROZEN OR JUST AFTER PREPARING THE WRAP IN THE LAST STEP ABOVE. Find below a step by step pic of the wrapping stage mentioned above. I FOLLOW THE SAME WRAPPING TECHNIQUE AS ABOVE, FOR CHICKEN FILLET STRIPS(COOKED/CRUMBED) AS ABOVE, AS WELL AS FOR COCKTAIL VIENNAS WHICH I FRY AND COOL BEFORE WRAPPING IN PASTRY. YOU CAN USE ANY TYPES OF MEATS, AND OPT TO NOT HAVE IT CRUMBED, BUT ENSURE THE MEAT ISN’T TOO SAUCY. I do hope you give this recipe and idea a try, and I look forward to YOUR FEEDBACK. KINDLY SHARE MY POST AS IT APPEARS HERE, OR WITH A LINK BACK TO THIS POST. SHUKRAN/THANK YOU? Aaaannnnd it’s back to Foodie Blogging, Who doesn’t love food, right?. So to those wondering since my post on Easy Lamb Curry, “So Marsay, if you don’t eat curry, what did you have at the lunch?” . Well suspense is over my friends, Chow Mein it was??. Chicken Chow Mein it was!! When I am having guests over, I do usually prefer to make two main dishes for a meal, especially if I am not familiar with their taste preferences. On that lovely afternoon, both the Indian and Chinese dishes were a hit, what more can a host ask for than a happy and satisfied guest. 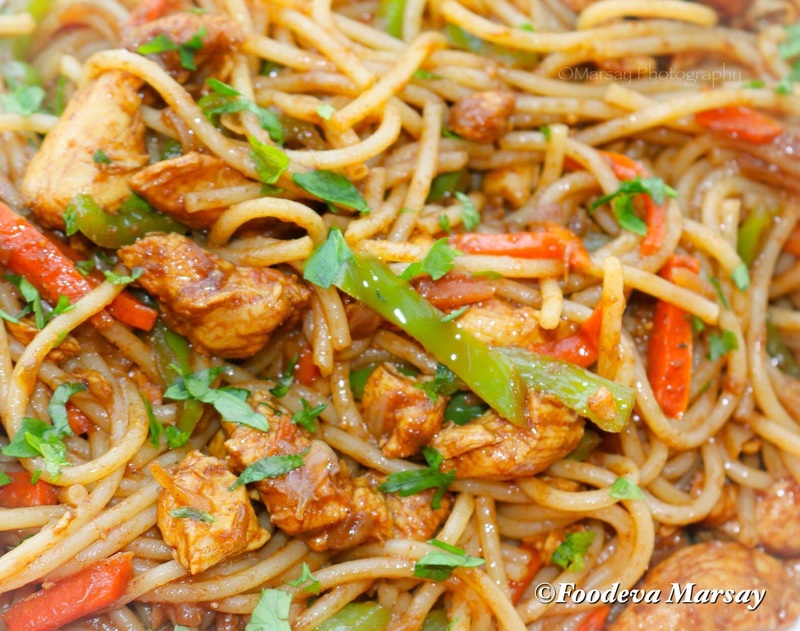 Now Did You Know …CHOW MEIN is Fried Noodles ??? Have a look at a brief explanation below, with Special Thanks to Google and Wikipedia, What would we do without these two hey?. Chow Mein is the only Chinese type of dish I really enjoy. So this dish would feature once a month somewhere on my meal menus. These flavours from a faraway, mystical land has proven to be quite popular in many Chinese and Indian restaurant menus back home in South Africa. How popular is this dish in your part of the World, do let me know??. So here is my version of this dish, hoping you all do give it a try and as always feedback is most definitely appreciated.
? Add chicken to the onions and cook over low heat together with 1/4 cup water until water burns out.
? 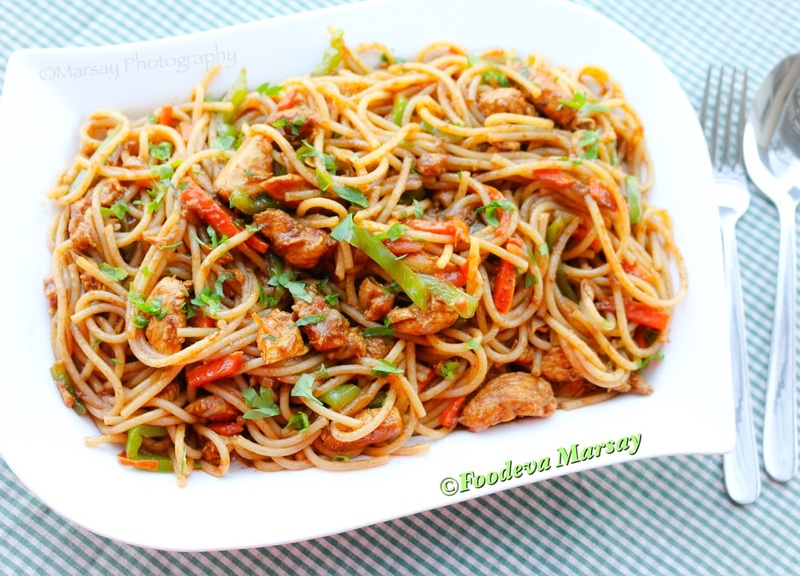 Chicken Chow Mein is ready to be served garnished with chopped spring onions/parsley. ?I usually Break the batch of Spaghetti halfway down its length, makes a little go a long way (shhhh…it’s our little secret? ), Do not add all of the Spaghetti during the tossing stage, we want a good balance of chicken-vegetables-pasta/noodles. Excess boiled spaghetti freezes well in a zip-lock freezer bag. ?Try adding 1 Cup of shredded Cabbage and/brocolli/baby corns during the Stir Fry point in recipe, Remember these are just optional, The recipe is just perfect without it too. ?Try Shredding/Grating your carrots if you have younger kids. ?Soy Sauce/Oyster Sauce/Fish sauce may be used instead of the Worcestershire Sauce. ?Why not give Beef/Prawns a try if Chicken is not what you prefer. I LOVE Chicken, can you tell?. So You guessed right, that’s the 1st thing I would opt for at any Dinner or Restaurant. More specifically I enjoy the Chicken Breast most, for those of you that know me *Fussy Eater* ? ?, just letting you all know in case you plan on throwing a dinner party you invite me too?. While I await YOUR DINNER Invites, let me share with you this recipe, an idea I took away from my short getaway to Muscat, Oman. I have a sneaky suspicion that the Chef at the Intercontinental, may have been psychic to know I LOVED Chicken?. I througly enjoyed the way chef prepared the chicken, it was a simple dish yet succulent and full of flavour??. I vowed to myself I would have to try out something similar when I got back home to Bahrain. So here is my take on this flavourful Chicken, today I used a whole Chicken which I cut into quarters , but any cut of chicken would work perfectly with this. ~ Marinate the chicken with all the ingredients, except the onions, oil,butter and Vegetables. ~ Heat the Oil and Butter in a Pot, and sautè the Onions until transparent. ~ Add in the Chicken Pieces, and Brown lightly on both sides. ~ Lower the stove heat to medium/low, Add in half Cup Water. ~ Allow to gently simmer (10 minutes) and then add in the Potatoes. ~ The Chicken is ready when the butter surfaces up (add a few slices of Lemon at this stage-may be removed before serving), and allow the chicken to brown lightly, before serving. Note : you could also use chicken stock in the cooking process instead of water. As I had promised, this year I intend to give my palate, and yours, a little taste of the World. While on travels to Turkey, Bahrain and the UAE, I had “attempted” to have some dishes I would normally not have been exposed to here in South Africa. While Imran had enjoyed the lamb or beef dishes, I on the other hand, opted more for chicken dishes, especially ones without any bones in them (told you, I was, and still am, a fussy eater?) , like anything with chicken fillets I loved. At most of the Turkish Resturants, I had opted for the Sįs Taouks, which were of course Chicken ?. No matter which end of the World you in, this type of dish is fairly common, and may be recognised by a variety of names be it Shish, Seekh, Sosaties or Skewers. Making this different to the rest of the World’s , is the spices used, and the taste that’s synonymous with many parts of the Arab World. Here I have attempted to recreate the Chicken Shish Taouks I so throughly enjoyed abroad. It was a Huge Hit at home when I made these for a braai evening, and has prompted me to do a Blog Post on it. Looking forward to all your comments, and likes below;). ~•in a large mixing bowl, place the yogurt, Lemon Juice, mint leaves, garlic,chillies(if using),Oil, salt, pepper and cumin spice. ~•mix the above well together, using a balloon whisk. ~the rest of the sauce must be kept in the refrigerator, to be used as a dipping sauce for the Chicken Shish Taouk. ~Thread the marinated chicken onto metal/wooden skewers, and alternate with different coloured peppers in-between the chicken *(Use as Little or More peppers as preferred). ~Grill the chicken over medium heated coals until lovely golden in colour, ±15-20 minutes, turning and basting, with any leftover sauce from marinade, a few times to cook through. ~Place the ready grilled Chicken Shish Taouks onto a bed of Middle Eastern Rice Pilaf and Salads OR with Flat Breads. ~Serve hot with the saved portion of Yogurt and Mint sauce.